A great phone for hard of hearing individuals, the Doro PhoneEasy 1010 Duo Amplified Telephone is a cordless phone with a speakerphone that looks, feels and sounds great. It's vital that the elderly and individuals with hearing difficulties can confidently use their phone - it's a valuable lifeline to the outside world and helps them to continue to live their lives. The Doro PhoneEasy 1010 Duo features a 20mm x 35mm white backlit display helping to make names and numbers easy to read. What's more, the menu system has been designed for maximum usability to ensure that you don't get lost. Alongside it's bright display the Doro PhoneEasy 1010 Duo also features up to 24dB receiver amplification - making it an ideal phone for hard of hearing individuals with mild hearing impairment. This, combined with the PhoneEasy 1010 Duo's Doro TrueSound ensures that phone conversations can be heard loud and clear. It's even hearing aid compatible for maximum conversation clarity. 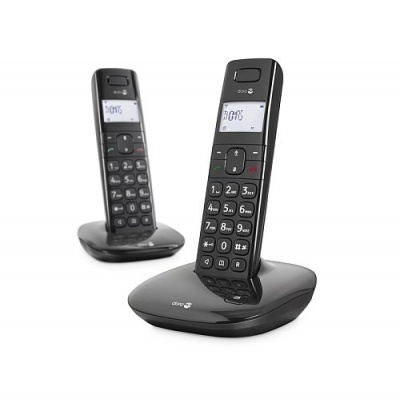 Two handsets are included with the Doro PhoneEasy 1010 Duo - enabling you to position them around your house for maximum convenience and ease of use. The PhoneEasy 1010 Duo also features 50 phonebook positions, enabling you to easily store and access the phone numbers most important to you.